It's fair to say that I don't travel to Horsforth very often, from where I am living currently it takes me a train a bus and walk to get there. However Horsforth has caught my eye as a potential place to live when I come to move on next. The size of the town centre surprised me when I first saw it, there are a plethora of bars, pubs, restaurants, cafes and a few charity shops too. It looks like a nice place to settle down. 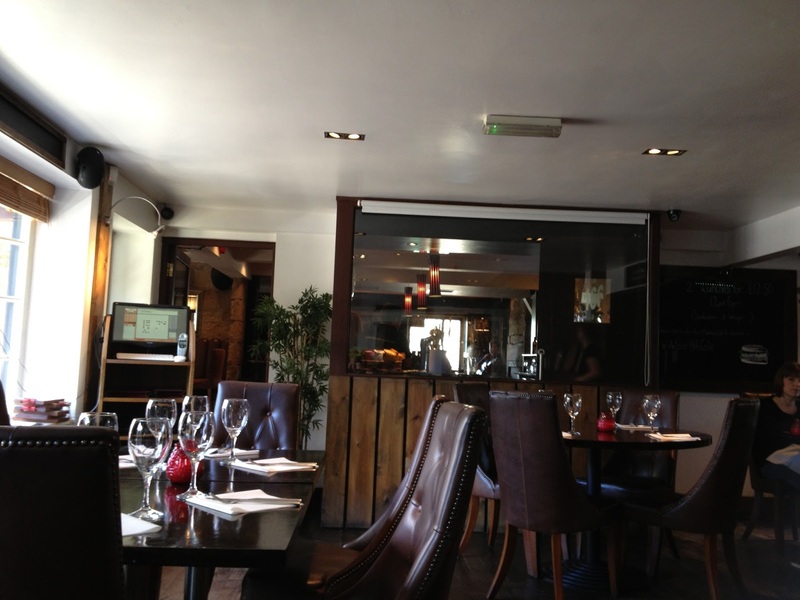 I was delighted to be invited to Bar 166 & Bistro in Horsforth due to the above and from reading through their website. 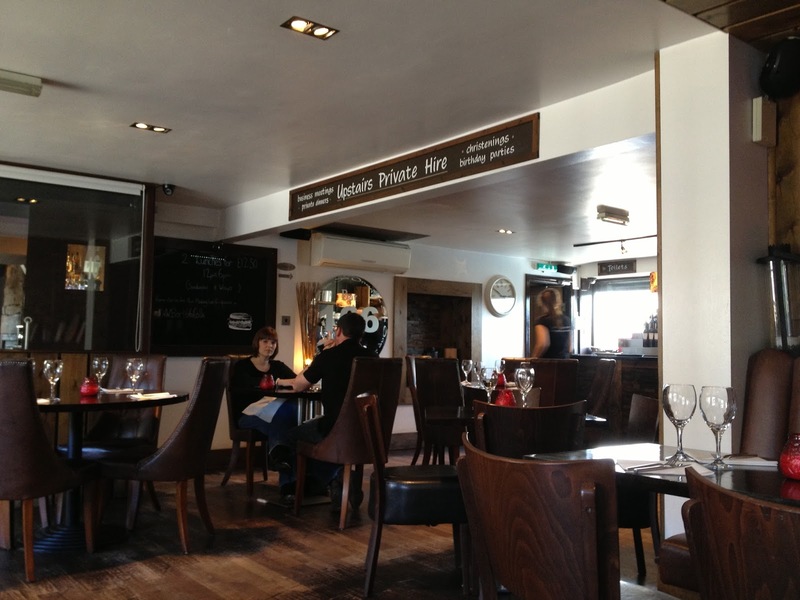 On their website they proudly display their Trip Advisor 'Certificate of Excellence', their food is from local producers where possible, and their ethos is to create luscious British food at an affordable price. I took a visit on a Sunday for their Sunday Lunch Club, we had a table booked for 2pm but as it was fairly quiet a booking may not have been necessary. 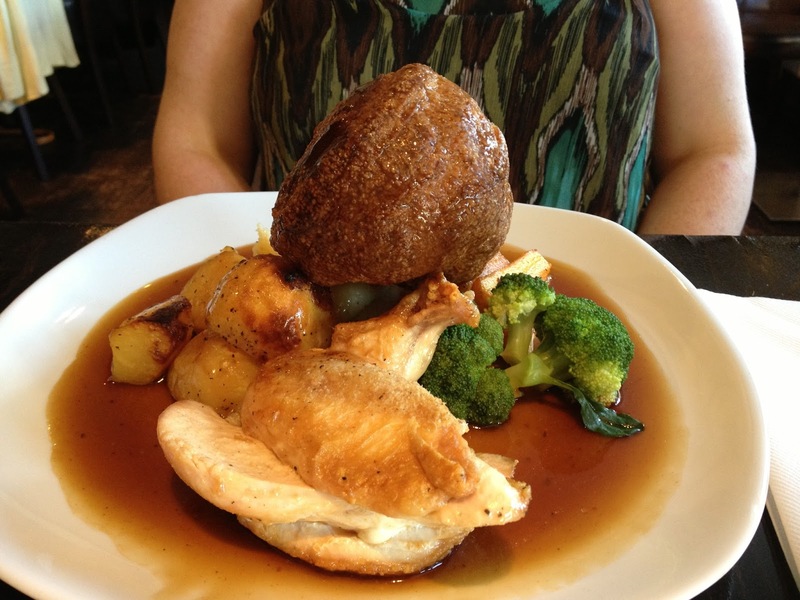 The Sunday Lunch Club is on all day and according to their website and publications they serve 'The Best Sunday Lunch in Horsforth'. Live music is played 2-4pm every Sunday in the Bar. Swiftly shown to a seat in the middle of Bistro we were handed menus and a specials board. Drinks were taken, a glass of red wine for me and a pint of coke for A. I had a quick glance over the menu, but I have to admit I didn't take much note, I was there to try out the best Sunday Lunch in Horsforth. The choices for Sunday lunch are pork, beef and chicken served with all the trimmings (trimmings not detailed on the menu... so it was a bit of surprise). 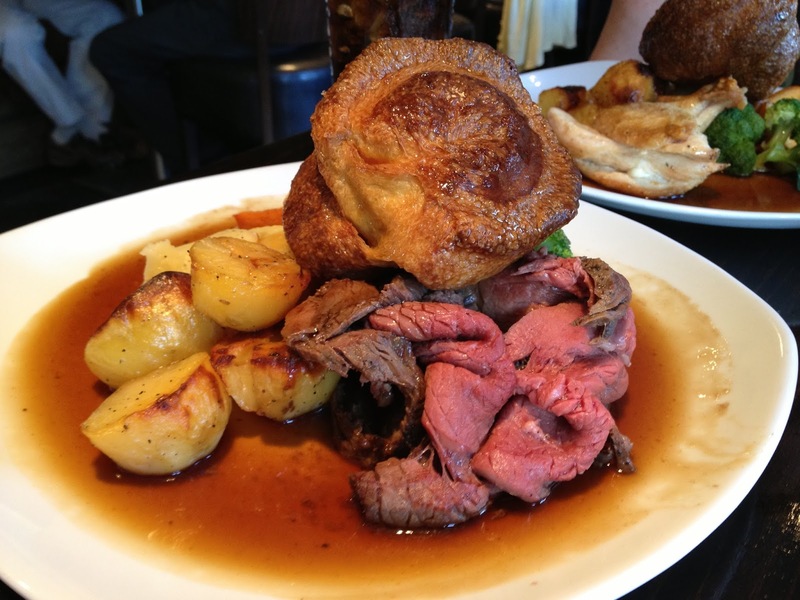 It is £9.90 per person for a Sunday roast. I decided to go for beef and A went for the chicken.. to be different. Are you ready for this picture? Get a good look at that MEAT. I'm writing this post the evening following eating this lunch and even though I am still stuffed just looking this picture (and meat) again, I could eat this all over (and probably be sick). What you can't really see behind the massive Yorkshire Pudding is some mash, honey glazed carrots and parsnips and some broccoli. For a better view of the broccoli here is A's chicken roast. I am a serious roast dinner eater. I have yet to find any restaurant that can come close to my dad's Sunday roast. Reviewing others roast dinners is done meticulously and in fine detail (be warned all further mother/father in laws). I'm struggling to decide upon the order I should review each component I will go from veg to carb to meat. Broccoli - crunchy and firm, mine and A's preferences are that this should be a little more tender. A difficult process as too long on the boil or in the steamer and it disintegrates and turns to mush. Honey glazed carrots and parsnips - couldn't taste too much honey I would have probably added a little more myself (my own preference perhaps?) but the carrots were cooked to perfection although the parsnips could have done with a little longer but both good to eat. Mash potato - seasoned with pepper, no lumps squirted in to a spiral on our plates. It was creamy and luscious I could have probably eaten a bowl of it. Roast potatoes - (we're getting serious now) crispy on the outside and fluffy on the inside. Pretty much perfect to be honest! Yorkshire pudding - no one is going to beat my dad's Yorkshires but this was 99% there. Great rise and a superb size. The 1% lost from it being just a bit soggy, this could have been due to the gravy soaking in before the plates reached our table or maybe they weren't fresh from the oven straight to our plates? I don't know I wasn't in the kitchen spying like I am at my dad's. Meat - The beef was AMAZING. Well done local farmers and well done chef for cooking it so perfectly. It was a refreshing change to not be served a thick slab of chewy beef with my dinner. This was so tender with the rarer parts almost melting in my mouth, the taste shining through as it wasn't overly roasted. The beef would have been too rare for A and I expect others too so a word of caution may be needed for those with choosier palates. A said her chicken was really nice and it looked good too, it didn't look dry and you get a good sized portion too. Too little meat on your roast can really spoil the experience. In regards to the live music, I had expectations of the live music being in the bistro as it is advertised alongside the Sunday Lunch. The live musician was in the bar and there was a wall and screen which separated us, there was a slight overlap of the musician starting in the next room and the recorded music still playing in the bistro, which was a bit of a head mash. Thankfully they rectified it turning off the recorded music and opening the door so we could just hear the acoustic guitar next door. After we had finished our lunch we decided to have a rest in the bar and listen to the music. It was quite loud and raised voices were needed when the musician hit the high notes, it made me thankful that it was just a distant murmur in the background whilst we were eating. The live music did create a great atmosphere for a Sunday afternoon tipple. The bar like the bistro wasn't brimming to capacity and there was space in the beer garden too, adding to the general relaxed atmosphere. I even spied that they sold Saltaire Blonde - a good local beer I am struggling to find on tap outside of Saltaire/Shipley. 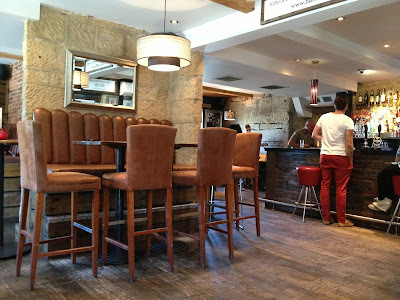 A few pictures of the Bistro and Bar. I mentioned that whilst I was there I didn't really pay much attention to the menu, I did take a picture and I have since looked on their website. 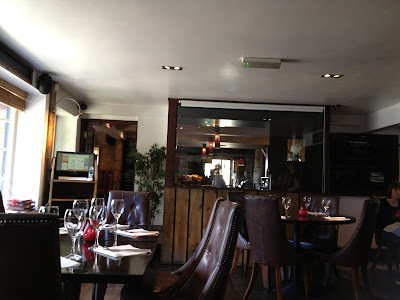 There are plenty of dishes I would love to try and would recommend to a friend we make the trip to Horsforth to do so. We noticed as we were walking out that they have 'Steak Tuesdays' in which steak chips and a beer/glass of wine is £10 per person. As you have probably gathered I loved the beef which was served to me on this day so I would definitely like to go one Tuesday and sample their steaks.... If I move to this area I definitely will return, time and time again.